Since that first dinner, many traditions have been added to State and Official Visits – yet the common theme of forging friendships, exchanging knowledge and building bridges that last for years to come remain unchanged. As the world’s two largest democracies, India and the United States share common ideals and strengths, and the United States and India are working together to address a number of global challenges of the 21st Century—from security to the economy to climate change to the health and education of our people. The state dinner for Dr. Singh was held held under a tent on the South Lawn of the White House. 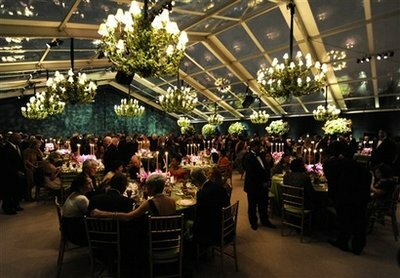 The décor reflected the Obamas’ dedication to green and sustainable elements and featured a garden theme. Tables will be covered in apple green linens. Deep purple flower arrangements at each table pay homage to the state bird of India, the Indian Peacock. The centerpiece bouquets were composed of flowers that are evocative of the classic American garden: hydrangea, garden roses, and sweet peas in a rich palette of deep plum, purple and fuchsia. Arrangements of magnolia branches will surround the walls of the tent. Magnolias are native to both India and the United States. The magnolia, ivy, and nandina foliage used for the occasion were locally grown and sustainably harvested. The tables were set with the following china from the White House’s historic collection. Service Plates – Eisenhower : Porcelain, 1955, New Castle, Pennsylvania, Castleton China, Inc. U.S. Government purchase, 1955. Service Plates – Clinton State China Service : China, 2000, Trenton, New Jersey, Lenox, Inc. Gift of the White House Historical Association, 2000. Commissioned to commemorate the 200th anniversary of the White House. Dinner Plates – George W. Bush State China Service : China, 2008-2009, Kinston, North Carolina, Lenox, Inc. Gift of the White House Acquisition Trust, 2009. The dinner was prepared by the award winning guest chef, Marcus Samuelsson. Mrs. Obama worked with Guest Chef Marcus Samuelsson and White House Executive Chef Cristeta Comerford and her team to create a menu that reflects the best of American cuisine, continues this White House’s commitment to serving fresh, sustainable and regional food, and honors the culinary excellence and flavors that are present in Indian cuisine. Herbs and lettuces were harvested from the White House Kitchen Garden. White House Executive Pastry Chef William Yosses and his team created the desserts. The pears were poached in honey from the White House Beehive. Desserts were garnished with mint and lemon verbena grown in the White House Kitchen Garden. I have attached the dinner menu at the bottom of this article. The dinner entertainment included two Academy Award winning musicians, Jennifer Hudson and our own A.R. Rehman. The other performers included eight time Grammy nominee Kurt Elling, the National Symphony Orchestra conducted by Marvin Hamlisch and the United States Marine Band. The star studded guest list included celebrities like Steven Spielberg, Blair Underwood, M. Knight Shyamalan, Dr. Sanjay Gupta, Kal Penn, Bobby Jindal and many others. This entry was posted in Generic and tagged Add new tag by sudipta. Bookmark the permalink.